Car companies, telecomms giants, and mobile providers are all staking out their turf at the 2016 edition of the Consumer Electronics show, scheduled for next month. It’s not just a consumer electronics showcase anymore. Carmakers want to turn the next iteration of the Consumer Electronics Show, scheduled to kick off on January 6, into part auto show, part technology showcase. 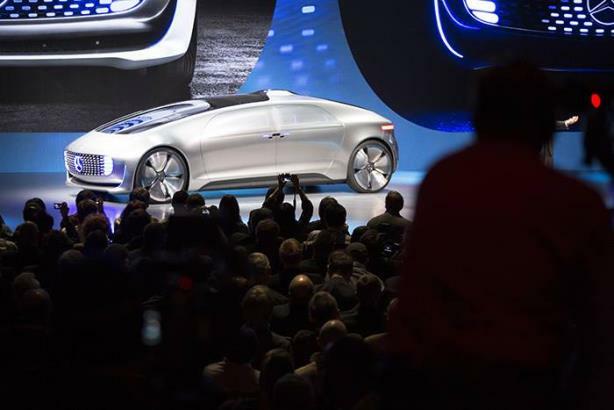 Companies such as Ford Motor, General Motors, and Volkswagen say CES 2016 will be a showcase for the latest advancements in in-car connectivity, electric mobility, and self-driving cars. Six other vehicle manufacturers are planning to take part in CES in a few weeks: Audi, BMW, Fiat Chrysler Automobiles, Hyundai, Mercedes, and Toyota. CES 2016 will also feature more than 115 exhibitors from automotive tech. That number is short of the 141 from earlier this year; nevertheless, auto technology will account for a record 200,000 square feet of floor space at the coming show. Krista Silano, PR specialist at the Consumer Technology Association, says that figure is up from the prior year, indicating some participants will have sprawling presences. Ford Motor will have a physical presence in nine areas of the show, says Jennifer Flake, executive director of the Americas and global product communications for the automaker. "We wanted the opportunity to really engage in different ways and with different people as they move through the show," says Flake. Ford Motor president and CEO Mark Fields will kick off CES press day on January 5 with its first press conference. Later, he’ll join the automaker’s other senior leaders for a dinner with key media, such as The Wall Street Journal, Re/code, and Engadget. Flake says Ford will use the show as a platform to update media on its Smart Mobility Plan, first announced at CES last year during Fields’ keynote. The goal of the plan is to use innovation to drive connectivity, mobility, and autonomous vehicles, among other goals. "CES has proven to be a really good venue for connecting with tech media. We want to show them how we’re moving from an auto company to an auto and mobile organization that is trying to innovate at the speed of tech," adds Flake. She notes that Ford has expanded its scope at CES ever since debuting at the show in 2007 with Microsoft’s Bill Gates. Many consider that moment the first big showing from an automaker at CES. While she says more technology outlets are sending reporters to auto shows than in the past, "You still get a much higher concentration of tech and consumer media at CES." A number of agency partners are assisting Ford at CES, including Hill+Knowlton Strategies. Emily Olin, senior account supervisor and leader of the Ford technology account at the agency, notes on the flip side, "More media outlets are sending their automotive reporters to CES." Yet with "more automakers every year unveiling new cars and tech, we’ve had to become more aggressive from a media outreach standpoint," says Olin. "There will be a full staff of executives from Ford on-site, so we make sure we maximize their time." She points out, "We’ve usually booked more than a hundred interviews even before we get to CES." General Motors secured a keynote address for its CEO, Mary Barra, who will introduce the production version of the electronic long-range vehicle Chevrolet Bolt EV. She will also discuss how GM is redefining personal mobility with advancements to its OnStar system. Michelle Malcho, comms manager for Chevrolet cars, says the brand will also have on-site activations supported by a robust social media plan. "It isn’t just one moment for us, but a whole show. We really want to position Chevrolet as a leader, so we’ve pulled all of those PR levers from keynote and booths to demonstrations and media interviews," she explains. "We’re doing everything you can think of – traditional, tactical, and out-of-the-box comms." Chevrolet has done something at CES for the last four years. Malcho says the event’s value comes from the fact that it attracts 150,000 attendees, more than all of the auto shows the brand participates in combined. "It also offers a different audience for us with tech leaders and trendsetters," says Malcho. "These are people with whom we are having more and more conversations." Chevrolet is working with several agency partners at the event. Embattled automaker Volkswagen first participated in CES in 2015, but the "response was overwhelmingly positive and underscored our belief that the show was not only a good fit for the VW brand, but an ideal venue to tell our innovation story," explains Darryll Harrison Jr., manager of lifestyle, regional, and innovation PR for Volkswagen of America. However, since then, a crisis has engulfed the automaker after it admitted using "defeat devices" on its diesel automobiles to get around emissions standards. Just this week, the company rehauled its senior executive team in the latest response to the crisis. At this year’s CES, Volkswagen is focusing on e-mobility. "For 2016, the brand will take it a step further by providing a look at the future of e-mobility while highlighting how smart technology will enable the automobile to become more interconnected to the world around it," notes Harrison. "As the automobile becomes more technologically advanced, it just makes sense that more car companies would seek to participate in the show." Herbert Diess, chairman of Volkswagen's passenger cars, will deliver a keynote in which he is expected to unveil an all-electric concept car. Other sectors that are on the rise at the technology show include entertainment content and broadcast platforms. NBCUniversal, YouTube, and Netflix are among the brands locked in to keynote slots. Anne Marie Squeo, director of corporate communications at Netflix, says, "We’ve been involved with CES for years with our CEO and other executives joining our consumer-electronics partner at events." However, this is the first time the company’s CEO, Reed Hastings, will deliver a keynote address. "We opted to do the keynote this year to highlight the role apps such as Netflix play in demand for these devices as more people around the world enjoy video content whenever and wherever they are," says Squeo. She adds that the show has become important for the company, not just because of the high-level partners in attendance, but also because of the PR opportunities. AT&T has typically leveraged CES to work with the developer community at its Developer Summit, now in its 10th year, which takes place just before the start of CES. However, after the telecomms company’s plan to buy DirecTV was approved earlier this year, there is media speculation it may use the event to announce plans to create original content for mobile subscribers. Fletcher Cook, VP of AT&T global media relations, did not share details, but he did say via email that "CES is evolving and no longer just a tech show. It’s about connecting your life, content, advertising, entertainment, and industry. AT&T is evolving, too, and recently acquired DirecTV becoming the world’s largest TV provider." "Through the unique combination of our TV presence and our leading wireless capabilities, we are focused on bringing customers an integrated, seamless, and smart entertainment experience delivered to virtually any screen, anywhere at any time," he added. AT&T is working with FleishmanHillard. As companies such as AT&T look to the show to launch new services, agency observers note that CES has become much more than a consumer technology product show. "The show has evolved from where companies only announced products to now services," says Andrew Silver, MD of the New York office at MSLGroup. "This blending of products and services, it is all related to the idea of the connected home and the Internet of Things. That is the broader play at CES." The auto show (as we know it) is dead. Long live the auto show.